Surface roughness has a very important influence on the life and leakage performance of a reciprocating sealing system. Ra, which is defined as the arithmetical mean deviation of the assessed profile. The inch equivalent parameter is CLA (centre line average). A surface finish of 0.4 mm Ra is exactly equivalent to 16 uin CLA. Rt, which is the total height of the profile. There is no mathematical relationship between Ra and Rt. Rq, which is the root mean square deviation of the assessed profile. The equivalent term in inches is RMS (Root Mean Square). The Rq (RMS) of a surface is approximately 10% greater than the Ra (CLA) value. The surface roughness parameters given above do not give any indication of the sharpness of the surface. The peaks of the profile should be well rounded as sharp surface finishes can lead to rapid seal wear. Piston rods are generally hard chrome plated. The hardness should be at least 67 Rockwell C (900 HV/10). This gives an excellent tribological surface and provided the rods are produced by an established supplier within a surface finish range of 0.1 to 0.3 mm Ra (4-12 min CLA) no major problem should ensue, although the optimum surface finish may well depend on the seal material. Bore surface finishes can be more problematic. 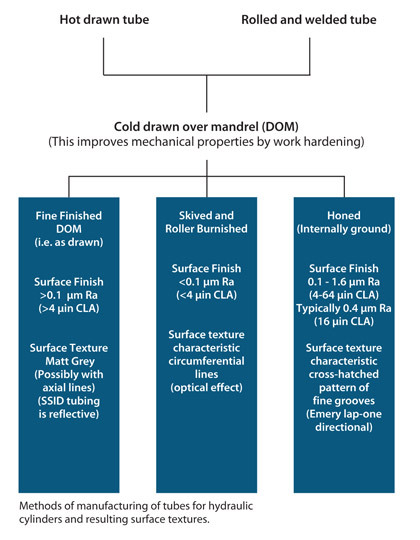 The typical methods of obtaining a bore finish are summarised in the figure below. Drawn over mandrel (DOM) tubing, as is, can be adequate, or a potential disaster depending on the actual surface texture achieved and the application. Increasing use is being made of Special Smooth Inside Diameter (SSID) DOM tubing, but in certain circumstances, mainly when the seal is being driven into the pressure, it can lead to wear of the seal through flow erosion. Such DOM tubing requires careful specification. The consistency of roller burnished or honed tube is to be preferred. Skived and roller burnished tubing is very smooth (less than 0.1 mm Ra) (4 min CLA) and may be too smooth for rubber sealing elements in some applications. True honed tube, produced between (0.1 and 0.4 mm Ra) (4-16 min CLA) is the most expensive, but has the best finish. The static sealing surface must not be ignored in the control of leakage. Generally, these are fine turned and should be free from chatter marks.